Yesterday was Day 3, the final day of Health 2.0 Silicon Valley. Another day packed with demos, networking and cutting edge insights. The highlights of Day 3 for me were seeing the winner of the XPRIZE Nokia Sensing Challenge announced, the session on Clinical Trials and Research, Health 2.0 International session and the session on the Frontier of Health 2.0. Mark Winter, Senior Director, Nokia Sensing XCHALLENGE came on stage and told us more about the competition, including how it was judged. The winner, Nanobiosym Health RADAR was also announced at the conference by Mark Winter. It must have been a difficult choice. The video below includes the announcement as well as hearing Anita Goel from the winning team speak about their journey. Peter Diamandis, CEO of XPRIZE came on stage, and he believes that in the future, patients will be saying, "Don't let that human touch me, he makes mistakes". The rise of machines, I guess. The session on Tools and Platforms for Clinical Trials and Research was very good. Bill Silberg moderated the session, which included Harris Lygidakis, Roni Zeiger, Anna McColister-Slipp and Joseph Dustin. Demos from the panel members highlighting how their tools could impact clinical trials. 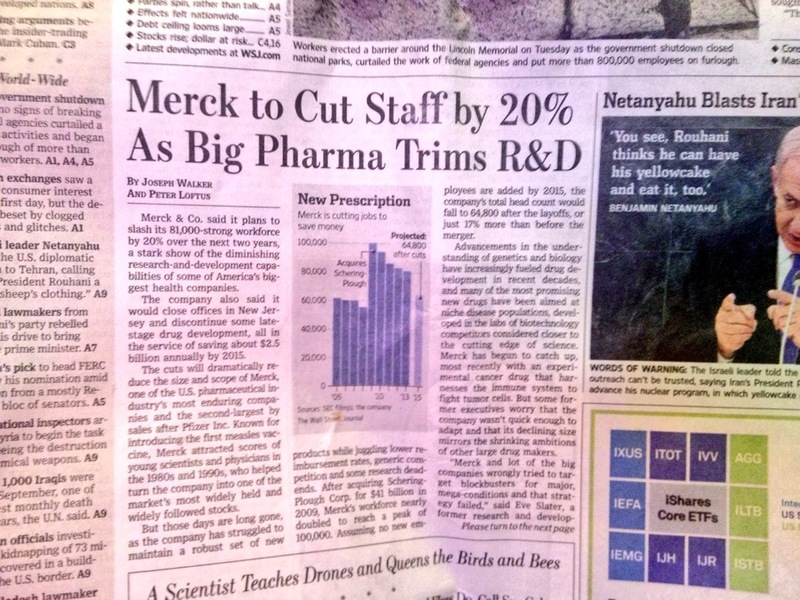 Very timely, as yesterday's Wall Street Journal had a headline on how Merck is cutting 20% of it's workforce in the next 2 years. Having worked within GSK R&D until 2012, I've always believed that there are immense opportunities for startups to help pharma deliver the medicines that patients are waiting for. However, many people in pharmaceutical companies are terrified of even using the word 'Disruptive' in the same sentence as 'Innovation'. The commercial opportunities in the #pharma industry for #health2con entrepreneurs are huge! Go find a pharma firm today and DISRUPT! In the afternoon, in the international session, we heard from Poonacha Machaiah at Qyuki talking about The Weightloss Project. What a brilliant idea! People who are overweight and lose weight can help those in the world who are malnourished and don't have enough to eat. James Mathews, Chairman of Health 2.0 India posed the question - how do we bring Health 2.0 to Southern Sudan or to Syrian refugees? I'm glad he was challenging us to think of those around the world who are underserved. I remember a phrase he repeated multiple times, "Use simple tools to do great things". In Frontier of Health 2.0, moderated by David Ewing Duncan, I loved hearing from Pasquale Fedele who showed us BrainControl, a device that gives people the ability to control assistive technologies with their thoughts using a headset and a tablet. Also heard from Louise-Philippe Morency, who shared his work with 'Ellie', a virtual interviewer specialising in facial recognition. Virtual humans in healthcare coming soon! Life isn't perfect, and neither are Health 2.0 conferences. Nearly all conferences I go to are packed with sessions, workshops, demos and exhibit halls. It's a challenge to try and fit everything in each day, as well as the all important networking with potential clients and collaborators. It's a personal choice, but if one wants to spend time meeting people at the conference, it can sometimes mean having to skip a session or two. Alternatively, some folks do their networking late into the night over a few beers or glasses of wine. Difficult choices, especially if one is jet lagged. Small things like having the Twitter handles of each speaker listed in the printed program would have made my life a lot easier. The wifi was hit and miss for me, I had problems connecting every day. It wasn't the fault of Health 2.0, I believe there were some attendees grabbing all the bandwidth. Whilst the venue had great facilities, the actual location was sort of like a big business park. Nothing to do or see if you wanted to stretch your legs and have a wander around. By and large, the conference was one of the better managed events I attend. A big thanks to all of the volunteers who were stationed around the convention centre all day and helping us get to the right room at the right time. This must have been one of the healthiest conferences I attended. According to my Misfits Shine activity tracker, I walked 2.8 miles during Day 3 of the conference. The layout of the hotel and convention centre meant a lot of walking! Coming from a walking city like London, it didn't bother me, but I could see that amount of walking bothered some American attendees. Why have I attended Health 2.0 conferences in the USA, Dubai, Berlin and Delhi? Why did I start the Health 2.0 Chapter in London? There is something unique in the vibe, that Matthew Holt and Indu Subaiya bring to each conference. Especially as they are far more down to earth and friendly than a lot of conference organisers I've met. That translates into an enjoyable experience for attendees! At other Health tech events, I've found sometimes, other attendees won't speak with you unless you are from a well known corporation or Venture Capital firm. I personally prefer the Health 2.0 Europe conference to the one in California. Why? Smaller group and I like smaller groups. As conferences become more popular they grow, it's inevitable. I prefer the 'intimacy' of conversations in a smaller group. When I run my Chapter meetings in London, I limit each event to 40 attendees, which means we aren't overwhelmed by having to meet 150 people during an evening. For me, it's about bringing diverse groups of people together and building a community that makes amazing stuff happen. Health 2.0 Europe was in Berlin last year, but this year, it's in my city, London. I'm grateful to have been given the chance to run a pre-conference workshop on Nov 17th on 'Health 2.0 Tools for the Elderly'. The increase in the aging population, and the burden on society as a result is one of the biggest crises in Global Health, the world faces in the next 50 years, and I sincerely believe we need to act NOW! If you are interested in demoing at my workshop and/or want to discounted entry into the entire conference, please get in touch. I'll do my best to help you. One of the reasons I love coming to Silicon Valley for events is just how progressive and laid back people are. They are very much focused on business like other parts of the world but Health 2.0 conferences are always informal and friendly. It's one of the few events where I can walk around wearing a Hawaii shirt and potential clients are not expecting you to be wearing a shirt and tie! I remember meeting a CEO of a tech company in a coffee shop in Silicon Valley last year so he could demo his software. Despite being very successful, he attended the meeting wearing a t-shirt, shorts and sandals. It's a small point, but again, it's very different from the traditional attitudes found on the East Coast of the USA and in Europe where where your parent's occupations and where you went to college can often dictate what opportunities come your way. I'm passionate about the potential of sensors, and meeting the teams from Xprize's Nokia sensing challenge alone was worth flying 6,000 miles for. Many observers are critical that Health Technology is largely developed by the 'worried well' for the 'worried well'. There is an element of truth in that. However, meeting the teams from around the world, it became clear very quickly that each team had designed their solution with the mindset of wanting to impact the health of 7 billion people. For those that haven't heard of the challenge, this infographic does a good job of explaining why the competition was set up. First of all I met Silicon BioDevices, who have developed handheld, disposable device that takes measurements from a drop of blod and instantly transfers the results to a mobile phone. And it costs $1 to make! Next I met Apollo, who have developed a nano spectrometer-on-a-chip. This tiny chip offers the same functionality as a $10,000 machine and can be embedded into wearable technology. Wandered over to i-calQ, who have developed technology that turns your smartphone into a portable laboratory and medical specialist. In addition, they developed a decision support system that interprets the results and then suggests how much medicine should be given to treat the patient. InSilixa have developed a CMOS chip specifically for biosensing. Nobody else does that! ABUS-urodynamics have developed a wearable device that measures urinary flow, anywhere, anytime in an easy and natural manner. Currently patients have to use toilet-borne equipment in hospitals to do this test. Fascinating stuff! Onto Quasar, who have developed a chair pad with embedded sensors that work through clothes to monitor the heart's activity, known as an ECG. Think of the applications for older people. Now, that's the unobtrusive monitoring that I want to see more of in the future. The programmable-Bio-Nano-Chip technology offers the ability to determine if a patient has had a heart attack, whilst they are waiting in the Emergecy Room of the hospital! Elfi-Tech - a sensor that can detect blood flow waveform. The sensor could even be incorporated into a watch! Mobosens - a smartphone based sensor, provides accurate nitrate concentration measurements. Allows citizens to collect and share environmental data. Nanobiosym Health RADAR - One drop of blood or saliva can be used to detect presence (or absence) of a disease's pathogen in real-time with gold standard accuracy. I'm so inspired by the genuine innovation from each of the 12 teams. When we registered at the conference on Monday, we were each given a plastic tag to vote for our favourite team. At 9.45am Pacific Time on Wed Oct 2nd, at Health 2.0 Silicon Valley, one Grand Prize Winner and five Distinguished Award Winners will be honored by XPRIZE with cash prizes of more than $1 million. I wonder which team will win the Grand Prize! My week is turning into a sensor fest, as after Health 2.0 Silicon Valley finishes, I'm off to Los Angeles to attend Body Computing 2013. Quoting from their website, "We pride ourselves on straight-forward and thought-provoking discussions (not marketing hype)", I attended last year, and the absence of hype was noticeable, which is refreshing. Another event worth flying 6,000 miles to attend. Innovation in sensor technology i something I deeply admire, but when I think of life back in England and around the world, one question springs to mind. Who is going to pay for all of this innovation in sensor technology? After all, many countries, especially the USA and those with aging populations very much want (and need) to reduce spend on healthcare. After all, money doesn't grow on trees.